Joey Bosa represents the kind of pass-rush ability that will tempt teams to pick him even if they're already set at defensive end. How heavily will free agency factor into the draft? You’ll hear a lot of ‘best player available’ talk from executives over the next few weeks, but NFL teams draft for need over talent more often than they’d like to admit. In 2012, Jacksonville selected a punter five picks before the Seahawks chose Russell Wilson for God’s sake. Okay, that’s an easy example. Here’s a better one: The Buccaneers, having walked away from starting safeties Tanard Jackson and Sean Jones after the 2011 season, reached for Alabama safety Mark Barron with the seventh pick in the 2012 draft. General manager Mark Dominik had the opportunity to take South Carolina corner Stephon Gilmore, but Tampa had just signed former Lions corner Eric Wright to a five-year, $37.5 million deal after his breakout season in Detroit. In the eyes of many teams and analysts, Barron’s rise into the Top 10 was bolstered by a lack of safety prospects with high grades. In 2015, he was converted to linebacker in St. Louis after three underwhelming seasons in Tampa. The Bills took Gilmore with the 10th pick, and today he’s considered among the top corners in the NFL. The Bucs tried to deal Wright to the 49ers a year later, but he failed a physical and was subsequently released, never to play another down. Keeping all that in mind, here’s how I think free agency affected the Top 10. This is how I think the teams will pick, not necessarily how they should. Best player available. This isn’t complicated. The only free agent who might have altered the Titans’ plan would have been Kelechi Osemele, but he just joined the Raiders for five years, $58.5 million. • WHO IS LAREMY TUNSIL? : A little background on the mammoth man from Mississippi who rarely grants interviews. 2. Browns: Carson Wentz, QB, North Dakota St. I believe if Tunsil were to fall to this spot, Hue Jackson would be very tempted to take the OT here and try to trade up from 32 for Memphis QB Paxton Lynch somewhere in the 13-20 range. Heck, the new Browns head coach might even think he could get away with drafting Michigan State’s Connor Cook at 32 and calling it a day. For the sake of this mock, let’s assume Tunsil is gone and Wentz’s upside is too tempting for the Browns to pass. • CARSON WENTZ, PRIDE OF NORTH DAKOTA: The boy from Bismarck took the NFL combine by storm and has a governor and senator in his corner as he tries to become the first quarterback taken in the 2016 draft. Rare confluence of best available and pressing need after the Eric Weddle breakup. You could make the argument for Notre Dame OT Ronnie Stanley, but Ramsey looks like a sure thing at more than one position. Let’s assume for a moment that Jerry and Stephen Jones are weary of dealing with the likes of Greg Hardy and Randy Gregory, so that rules out Joey Bosa and his baggage. Pairing Myles Jack with a healthy Sean Lee gives the Cowboys a dream scenario at linebacker. The Cowboys can wait until the second or third round to take an eventual successor to Tony Romo. I liked OT Ronnie Stanley here after the Jaguars signed Broncos 3-4 DE Malik Jackson in free agency, but I refuse to rule out Gus Bradley going with another defensive lineman. Bosa would play the edge in this scenario with Jackson as a three-technique tackle. The pair of them plus a healthy Dante Fowler could give that defense some unpredictability it’s been lacking. In this scenario, with Bosa off the board, the Ravens go with a tackle. Kelechi Osemele is now out of the picture, so Ozzie Newsome doesn’t have to overthink this one. There’s been talk the 49ers go with a quarterback here, but I don’t see them moving on from Colin Kaepernick just yet. (Even if Kaepernick is the guy, that wouldn’t rule out drafting a passer to sit behind him). I think it’s more likely Chip Kelly would draft a developmental passer in the later rounds and address other needs. With Stanley off the board, they throw linebacker Navorro Bowman a lifeline with a defensive lineman who can contribute immediately. Hargreaves fits here because Philly just unloaded Byron Maxwell to Miami (moving up from 13 to 8 as part of the deal), and Nolan Carroll is currently a free agent. Plus Hargreaves is arguably the best all-around defensive back available after Ramsey. I could be convinced the Bucs would help out young Jameis Winston and go with Ole Miss WR Laquon Treadwell here, but the best fit is Lawson, a versatile edge rusher who should have no problem against the run. The Bucs are wasting DT Gerald McCoy’s best years by surrounding the generational talent with mediocre linemen. Time to fix that. By signing Damon Harrison and Olivier Vernon, the Giants addressed their defensive line problems (by throwing a lot of money at it). It’s high time to look at that very one-dimensional offense, which targeted Odell Beckham 96 times to Rueben Randle’s 56. The Giants get a receiver in Treadwell whose size (6-2) complements Beckham nicely. So you have two quarterbacks—Jared Goff of Cal and Paxton Lynch of Memphis—falling out of the Top 10 after San Francisco and Chip Kelly pass on a thrower. From what I gathered at the combine, there’s little chance both of them will make it past the middle of the round. That said, I think there’s potential for the Browns to pass on a quarterback at No. 2, which would move all three passers down the board a few spots. In that scenario, if the Browns want Lynch, they would probably need to trade down to 17, 18, or 19 just to get in front of the Jets, who will be in the market. 1. A QB could go late in Round 1. With Denver letting Brock Osweiler go to the Texans in free agency, one has to start thinking about Michigan State's Connor Cook and Penn State's Christian Hackenberg as potential first rounders at No. 31. GM John Elway is likely to sign or trade for a veteran (Robert Griffin III and Colin Kaepernick come to mind), but either would only be considered, at least initially, as a stopgap. 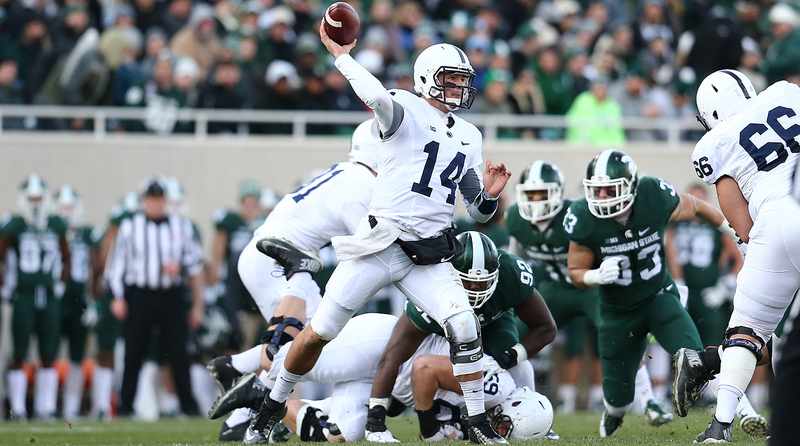 It would be a dream scenario for either Hackenberg or Cook, who would get Gary Kubiak and Elway as mentors and the benefit of a world-class defense. 3. The next few days are big. Three huge Pro Days to keep an eye on as the major schools begin trotting out prospects for one last public audition. Potential Clemson first-rounders Lawson, DE Kevin Dodd and CB Mackensie Alexander will run Thursday, as will Oregon’s Buckner. Ohio State’s Bosa, RB Ezekiel Elliott, LB Darron Lee, CB Eli Apple and OT Taylor Decker will perform Friday. 4. Atlanta’s apology. When the Falcons issued their apology for one of their coaches asking Ohio State’s Apple if he was gay, it came as a surprise to some that the coach was identified. The team’s transparency and assistant coach Marquand Manuel’s apology came after team staff met with NFL consultant Wade Davis, a former NFL player and executive director of the You Can Play Project. 5. Scouts from 23 teams showed up to watch Noah Spence perform at the Eastern Kentucky Pro Day last Friday. There were seven teams represented at EKU’s Pro Day last year, and four the year prior. Spence, who was banned from the Big Ten for failed drug tests, may have slipped into the late-first or early-second round after improving only marginally on his 4.8 combine 40-yard dash and underperforming in his combine interviews, per two coaches who hosted the edge rusher. Pick one: 170 completions. 10 touchdown passes. Seven starts. That's the résumé of one Brock Osweiler. And if you're looking for an indication of just how confident Bill O'Brien is in this upcoming class of quarterbacks (which includes his one-time pupil, Christian Hackenberg), look no further than the four-year, $72 million contract the Texans just gave Osweiler to bail on the Broncos.